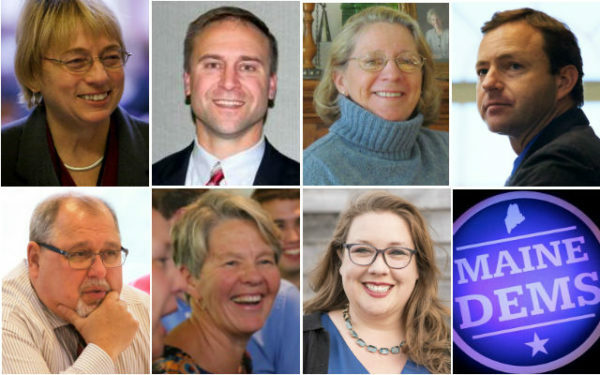 Maine Democratic gubernatorial candidates Janet Mills (clockwise from left), Adam Cote, Donna Dion, Mark Eves, Diane Russell, Betsy Sweet and Mark Dion. Maine’s tight Democratic gubernatorial primary may pull closer after ranked-choice tallying, but Attorney General Janet Mills is favored to win, according to Bangor Daily News simulations that combined unofficial returns with exit polling data. BANGOR, Maine — Maine’s tight Democratic gubernatorial primary may pull closer after ranked-choice tallying, but Attorney General Janet Mills is favored to win, according to Bangor Daily News simulations that combined unofficial returns with exit polling data. On Tuesday, Maine became the first state in U.S. history to decide elections by ranked-choice voting, a method that allows voters to rank candidates in order of preference. If no candidate wins a majority, the candidate with the fewest first-round votes is eliminated and their second-place votes are reallocated to others. This is repeated until someone wins a majority. But the method — which was approved by voters in 2016 and upheld by voters on Tuesday — has only left the outcome of one of four races in doubt. That’s the seven-way race for the Democratic nomination to take on Republican Shawn Moody and two independents in the November race to replace the term-limited Gov. Paul LePage. In that primary, Mills had just under 40,600 first-round votes — or 33.1 percent — with attorney Adam Cote in second place with just over 34,800 — or 28.4 percent — with 88 percent of Maine precincts reporting unofficial results to the BDN as of Friday afternoon. Those two were followed by lobbyist Betsy Sweet at 16.3 percent of first-round votes, former Maine House Speaker Mark Eves at 14.5 percent, state Sen. Mark Dion at 4.5 percent, former state Rep. Diane Russell at 2.3 percent and former Biddeford Mayor Donna Dion at 1.3 percent. However, clerks only released first-round results to the public on and after Election Day. Ranked-choice counting must be done by the secretary of state’s office. It is underway in Augusta now and unofficial results are expected to be released next week. But exit polling gives us a good idea about Mills’ advantage. The BDN did exit polling of both gubernatorial primaries in eight cities and towns on Election Day, gathering ranked-choice voting data from 491 people who said they were Democrats. The data were then weighted according to real first-round returns as of Friday morning and by the age and gender of people who did and didn’t respond to the survey and 1,000 ranked-choice simulations were done. The most common result in those simulations was a Mills victory. The rest of the field followed in the same order under ranked-choice voting as they fell in the first round of voting, although Mills only beat Cote in the sixth and final ranked-choice voting round by 6,650 votes. This is almost wholly attributable to Mills’ first-round lead, which stood slightly higher at 5,776 according to real returns on Friday. The model predicts that Mills does not win a plurality of later-round votes until the elimination of Betsy Sweet in the sixth, and final, round. Sweet and Eves campaigned together and Eves defended Cote after attacks from Mills and her allies near the end of the race. The model sees Sweet getting 44 percent of Eves’ reallocated votes after he is eliminated. Then Cote gets a little less than half of Sweet’s reallocated votes, not enough to overcome Mills’ early lead. Democrats and Republicans used ranked-choice voting differently. While 491 Democrats responded to the BDN survey, only 198 Republicans did. Democrats were likelier to rank more choices, with 82 percent of them ranking a third choice. Only 52 percent of Republicans got that far in a four-way field. This could be because of Republican antipathy toward the method. The raw exit poll was a good predictor of the Republican race, but not the Democratic race. Businessman Shawn Moody won 56.5 percent of votes in the Republican gubernatorial race in a romp over Maine Senate Majority Leader Garrett Mason at 22.9 percent, former Health and Human Services Commissioner Mary Mayhew at 15 percent and House Minority Leader Ken Fredette at 5.7 percent as of Friday. The raw exit poll had them at 54 percent, 26.3 percent, 15.2 percent and 4.5 percent in the first round, respectively. The raw Democratic poll seemed to represent a less valid sample of Democrats, putting Cote in first place at 27.3 percent, Sweet at 27.1 percent and Mills at 26.1 percent. It may be that Sweet’s progressive supporters were more likely to respond to a ranked-choice survey. That’s why the results of the survey were weighted for this analysis. Data scientist Jake Emerson designed the statistical model. BDN writer Darren Fishell contributed visualizations and writing. Exit polling was conducted by BDN writers Abigail Curtis, Beth Brogan, Lauren Abbate and Lori Valigra and University of Maine students Julia Casey, Nina Mahaleris, Becca Pelletier and Benjamin Tremblay in Belfast, Freeport, Rockland, Oxford, Topsham, Vassalboro, Hampden and Fairfield, respectively.